Something all conference and event organisers can agree on is that marketing an event you've been planning for months is HARD! The excitement and the nerves are starting to kick in; the weeks of hard labour are about to pay off you think; you have put blood, sweat and beers into making sure that your event is going to be a roaring success. Burning the candle from both sides, back and forth with suppliers, too many trips to the venue, food tasting at arb hours and the other million tasks that go into organising a great event have been completed. But, this is just the start of the race, that was the warm up. A successfully organised event doesn’t automatically result in a successful event. Marketing your function is where the real work begins; how do you do this? How do you make a noise, create a stir, get people to notice your event, to engage with your event and to sign up and register? How do you ensure that the seats are filled? Creating a buzz and awareness for your event, within your given constraints, can be challenging; especially in a market with many competitors. In this blog we are going to help you answer that question! We are going to show you how to use inbound marketing to successfully market your conference or event. Inbound marketing is the foolproof event marketing strategy and to guarantee a full house. This blog will help you attract the right crowd, increase awareness of your conference or function and improve engagement. Before we tap into how to use inbound for marketing events, let’s take a look at what inbound is. Inbound marketing focuses on creating quality content that attracts people towards your business and product; and leads them to a place where they want to be. Inbound differs to outbound as it isn’t interruptive, it’s disruptive. With outbound or traditional marketing, marketers use mass media platforms to reach a large audience with the hopes that their message will reach someone who needs their product or service. The audience isn’t even thinking about the product at that time. Inbound pulls in individuals who have a pain point that your product/service can resolve. In the conferencing industry; inbound aims to focus on the needs of the attendees and not that of the company. Empathising with your buyer persona’s problem and offering them a solution to that pain point, is at the heart of inbound. There are four steps in the inbound process; to attract, convert, close and delight. This is the process whereby a stranger eventually turns into a promoter. Using inbound to market an event is the way to go, as according to HubSpot’s State of Inbound Marketing Report, ‘Inbound marketing delivers 54% more leads into the marketing funnel than traditional outbound leads. Better yet those leads cost 61% less than outbound.’ Inbound marketing attracts customers; pulling them in with content which provides a solution for a problem that they have; which they may or may not be ready to resolve yet. It is the most effective way to turn strangers into customers and promoters of your conference. This is the most important part of the process; you cannot create valuable content if you don’t know who you are creating it for. To get started, you must develop an attendee (buyer) persona. A buyer persona is a semi-fictional representation of your ideal customer. The buyer persona is created from market research, data and existing customers. Include your persona’s demographics, behavioural patterns, challenges and goals. Create a story for each of your personas; someone that they can relate to and that you can create for. The trick is to bring these stories and characters to life. A well developed persona will enable you to pull in valuable customers, in your case, event and conference delegates and leads. Define the objectives of your event; look at your objectives the same way you’d look at your goals. Use the SMART technique to structure these out. Specific - what is the desired outcome and by when do you hope to achieve this. For example; 5% of the attendees must subscribe to your blog and mailing list two weeks after the event. Measurable - these must be hard numbers that can be measured. If there were 1600 people at the event, then you would want 80 of the attendees to sign up. Achievable - this must be realistic and something that you must be confident that you can accomplish. Relevant - the event that you are planning must be in line with your company’s goals and be something that you believe in; you can’t plan a conference on the beef industry if you are a vegan and if your business follows those principles. Timely - define the start and the end of your project; does it end when the conference end or once you’ve sent out the thank you notes? things that are standard. Asking them what their challenges are, their pain points, what would compel them to attend such an event and how they like to digest their content. 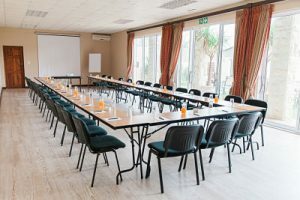 For the conferencing industry, you can look at your existing clients, the leads that you have engaged with but haven’t worked with yet and the general happenings in the industry as a whole. What is the age, gender and relationship status of your persona? What are their roles and responsibilities in their current position? What level of authority do they have? What are three of their key characteristics? What does success mean to them, what do they have to do to be successful in their role? How is this success measured? What do they do for enjoyment? What are their hobbies? Where are their watering holes? What are the challenges they face when looking for and booking a conference or event planner and venue? What are the three things that could make the conference and function planning setup easier for them? What are their reasons for not using you? Ask for more; the buyer persona isn’t static, and it is ever evolving. Use attendance forms and registration events to gather more information on your persona’s and to bulk them up. You are now getting the information that you require, from the horse’s mouth. This information can help you create the right content for the right people and give them the right solution for their challenges. Also look at your existing clients and leads that you have engaged with before. This will give you the best insight as to who you’re talking to. Remember that your buyer persona needs to be relooked at every few months. So your persona has been researched, developed and created. Now you need to invite them and get them to say yes!How do you get them to sign up to that registration page? How do you get them to commit to attending and how do you get them to engage? Types of content: from your research, you would have learnt how your persona likes to consume content, which platforms they resonate best with and what they want to learn more about. Use videos of the speakers who will be at the event; write a set of blog posts that address the challenges of the attendees and add a call to action that gets them to register for the event and use striking, single images for social media posts. Animated Gifs - these have been around for quite some time but have recently become more mainstream. They are easy to create, fun and stimulate your viewers. Blogs - one of the key forms of content in the inbound methodology; blogs are useful pieces of information that a persona can rely on. Blog posts can be used to earn a persona’s trust by giving them information that is relevant to them and that is helpful. Blogs work well as you can backlink, you can update them and you can always optimize them. Videos - with visual content becoming increasingly popular, videos are an easy way to grab the attention of your audience and also gain a customer. Viewers who watch a product video are 15-20% more likely to make a purchase than those who consume the content in another format. I nfographics- if you have numbers, stats or just want to point out some facts, an infographicis the way! Infographics are colourful, easy to read and jazz up any blog post. Infographics are also more likely to get shared socially, even more so on visual sites like Pinterest. If you aren’t sure on how to create one, check this out.When Martha Stewart hosted Hubspot’s Annual INBOUND conference in 2014, Hubspot came up with a quirky infographic that was in the form of a recipe (Martha Stewart is a chef). This piece of content helped drive awareness and increased attendance at the event. Memes - a meme is the best way to bring out your brand’s personality. It’s quirky, catchy and perfect for lighter posts. Keep up with what’s trending in the meme world and follow suit. Podcasts - some say that they’re outdated, but they’re actually still very in and very valuable. Podcasts are ideal for those persona’s that travel and are on the go a lot; they can consume content whilst on the run. Podcasts can also be filled with additional calls-to-action, from social sharing prompts to lead generated offers. Create content that is valuable and actionable: Does your content speak to the pain points of the attendees and are you giving them actionable advice that can solve their dilemma; can they use it? Does this content add value to the attendees who are reading the invite? Content must be findable: even if you are sending a direct email, the recipient will still have to look for it in their inbox, and there is a chance that it may get lost. Use SEO best practices (metadata, alt text on images, H1 and H2 tags, internal links, sharing videos and soundclips in various formats) and do thorough keyword research to enable your persona’s to find your content. Readable content: people are always short on time and will generally just scan through text until they find what they are looking for. Structure your content in the inverted pyramid style, with the important info on the top as that is where people will look. Use bullets and lists and break up your content into bite size pieces. Actionable content: your content must have an obvious, actionable command. It must be easy for people to comment, either privately or publicly. The contact and social share buttons must be easily visible. The actions that you are suggesting them to do, must be actionable on their scale and in their context. For example, saying that Google flies all their staff to Disney World for a weekend, and that they should follow suit is unreasonable. Think of your persona’s position, authority and budget when listing these actions. Relevance: Did you know that 43% of event attendees feel that events marketed to them are not relevant to their job or industry? Always think in your persona mindset when developing content; relevant content is as important as reaching out to the correct people. User intent - knowing what the user wants; do they want to go somewhere, do something or know something? Knowing what they want will help you create content that is relevant as well as help with your SEO. Repurposing content - a good piece of content that is well received is always worth repurposing. You can see what resonates with your audience and jazz up that piece with updated data and share it on different mediums. Write for the right stage - it’s easy to write for your persona, but are you writing for the right stage of the buyer’s journey that they’re in? If you write a piece that isn’t relevant to the stage that the persona is in, you could lose the lead. Offer the right content at the relevant time. These days people hold referrals and recommendations from their communities with higher regard and are more willing to engage; which is why social media has become so much more influential. Event organisers and attendees have set social media alight of late. Organisers want to share out their content and teasers, whereas participants want to engage with others who are at the event and they want to share out the best content from there, with their connections. This creates a great opportunity for event organisers to build up momentum and encourage engagement on social media, before, during and after the event. The most used social platforms for events are Twitter, LinkedIn and Facebook. Don’t hash the hashtag: the hashtag is one of the very first things that you should create. Short and catchy. That’s all. Don’t over complicate and confuse it. A long and complex hashtag loses shareability. Share the hashtag with everyone and put it everywhere. From the very start of the event prep, it should appear on email signatures, landing pages, websites and social posts. Make sure that all the speakers, vendors and attendees know what it is as well. Instagram stories: this feature is identical to Snapchat stories; you can post a video that self destructs in 24 hours and that viewers can’t comment on. This is awesome for teasers for brand launches, behind the scene shoots of the organisation and planning that go into an event. You can also tease an upcoming live stream and get influencers to take over for the day. These stories are a great way to connect to people and for them to see the lighter side of your brand. LIVE: most events are live streamed these days. The best way to do this is to use FB Live. Facebook Live is a live video streaming service that lets you broadcast from your mobile device straight to your Facebook News Feed. It is quite easy and user friendly; all you need to do is click the live button, write a compelling description, tag people and then get lit, live. These live videos see three times the engagement of traditional videos shared on the platform, and millions of users live stream on Facebook around the world.The Verge provides a great example of live-streaming, they stream some of the biggest events like the recent Galaxy S8 launch event. Photo Opportunity = Branding Opportunity: every photo taken at your event is a branding opportunity. If there is a dedicated space for photos, with a backdrop or an instaframe, people will take pictures there and most likely share them to social media. On Instagram,images with faces get 38% more likes than images without them. These photos will make your event marketing game strong. Create a FB event: It’s unfortunate that this little function is underused. Creating a FB event is a low effort and high return marketing tactic. You create an event and you’re able to invite your friends and participants and they can then share the event with their friends. FB will send them reminders of the event and every time that someone signs up for the event, it will be posted to their wall. By doing this, you get high-traffic ad space for free, and you get their friends – who they trust – to deliver those ads for you. LinkedIn Ad: If you have a company page, you can use this option. You can either have a sponsored post that pops up on the homescreen of your targeted audience, or have a text ad. The sponsored content is most effective for boosting awareness about a key presenter or to pique interest before your event goes on sale. The text ad would be best for promoting a discount on tickets or telling people that the event is almost sold out. The stand out characteristic of a LinkedIn ad is that you can target your audience using data that isn’t available on other platforms. LinkedIn targeting allows you to select the potential participants location, job title, industry, company size and years of experience. 4. Post event momentum: They came, they saw, but you have conquered. Keep your attendees hooked and make sure that you’re not forgotten when the conference ends. You need to maintain the content drive with highlight and recap videos from the event, photos and post event blogs. Uploading all the slides from the presentations to a SlideShare deck or embedding them in blog posts is also a good way to keep up the post event momentum. This type of content drive will help generate awareness for the next year's event as well. Mashable ran a fantastic post event photo contest at the SXSW conference in 2014. They encouraged people to post pictures of themselves at the event, and they did. People got creative and shared fun snaps of themselves which made the event look like a blast to those who didn’t attend. According to studies carried out by Eventbrite and Hubspot with event organisers and attendees, 75% of respondents felt that events are a valuable source of content and 79% of them attend events to learn.This statistic provides valuable insight as to how important conferences and events are and that with the right marketing tools, these events can take your business to the next level. This post has taken you through and explained the inbound methodology, taught you how to define the objectives and the persona’s and shown you how to use inbound thinking and inbound strategy through the various stages of the event planning and organizing process. With the actionable tips on how to drive event engagement on social platforms and how to connect with your audience; you will inevitably achieve greater attendance and success at your events. Well marketed events with high attendance rates can lead to an increase in lead generation, wider brand awareness and greater engagement with your buyer personas. You know have an arsenal that will help you inbound your way through your next conference event. Keep eventing, keep inbounding. Now that you know how to market your event, why not download our free eBook to learn how to host your trendiest conference yet?